Is your convertible top looking a little worn, or maybe mauled? Maybe it doesn’t run quite as smoothly as you’d like. We can fix it – if it’s a problem with getting the automatic top to work, we can replace those mechanisms. Cosmetic damage? No problem. We can fix it, including replacing the headliner and the glass. Tired of your old top? We can put a new one on for you. No matter how bad the damage, we can repair it for you. Maybe there isn’t anything wrong with that convertible top of yours. Good – keep it that way. Convertible tops require care and cleaning to stay at their best. Leave the top up whenever you aren’t driving. Not only is this common sense to keep unwanted items out of your car, but it will also help the convertible top retain its shape and avoid creasing. Don’t leave items in your top well area, especially if you have glass windows. Even soft items can cause breakage and warping. Don’t put the top down while it’s wet. This can cause discoloration and even molding. When cleaning your convertible, choose your cleaners carefully. Use only water-based window cleaners for glass windows, and soap and water or plastic cleaner for plastic windows. Do not use an abrasive brush. hard water, add softener until the water feels slippery. Wash your car in a shady area, not in the sun, as soap drying on your convertible top can cause discoloration. Move the car into the sun only after it has been thoroughly rinsed. 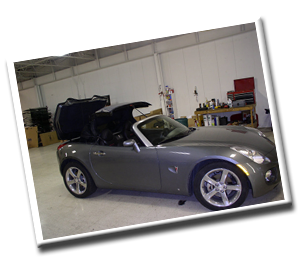 As always, if you aren’t sure about a cleaner or have a question about convertible care, you can always contact us!